Eternal Orthodox Church calendar for the 17.01 year 2017. In addition to the twelve Great Apostles, the Lord chose besides seventy other, lesser, apostles and sent them to preach to the Jews. He sent them out two by two before His face, to each town and place, saying: "Behold, I send you as sheep among wolves" (Lk. 10: 1-5). But as Judas, one of the Twelve, fell away from the Lord, so some among these Seventy withdrew from Him, not with the intention of betraying Him but from human weakness and lack of faith (Jn. 6:66). And as Judas"s place was filled from among the other apostles, so the places of these were filled with others chosen. 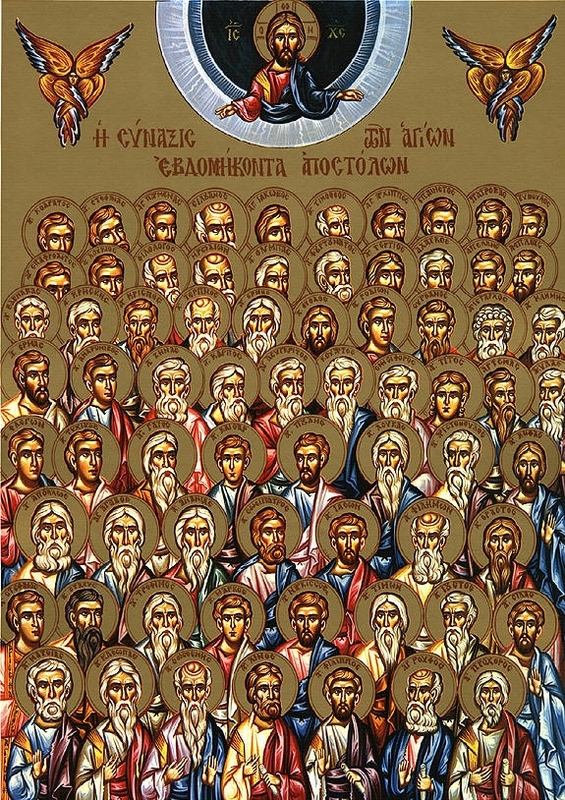 These apostles laboured in the same way as the twelve Great Apostles; they were the assistants of the Twelve in the spreading and strengthening of the Church of God in the world. They suffered much torture and malice, from men and from demons, but their firm faith and burning love for the risen Lord made them conquerors of the world and heirs of the Kingdom of heaven. Born in the diocese of Budim, of God-fearing parents, he became a monk as a young man in Zeta, then moved on to greater asceticism at Hilandar. 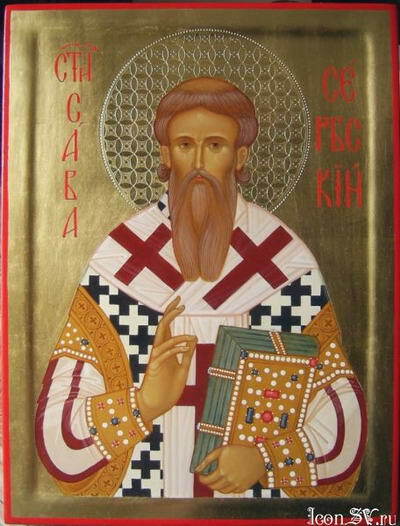 In time he became abbot of Hilandar, was then chosen to be Bishop of Zeta and, after some time had elapsed, to be Archbishop of Serbia. He was a man of great virtue and led Christ"s flock with zeal and love. He entered peacefully into rest at a great age in 1279, exclaiming as death drew near: "Into hands, O Lord, I commend my spirit."" His relics are preserved in the crypt of the church at Pec. The MonkMartyr Zosima came from Cilicia and was an inhabitant of the wilderness. During a time of persecution against christians under the emperor Diocletian (284-305) Saint Zosima was seized and subjected to fierce torture for the faith, but by the power of God he was preserved unharmed. Having beheld such a miracle of God, the prison head by the name of Athanasias believed in Christ and was baptised. 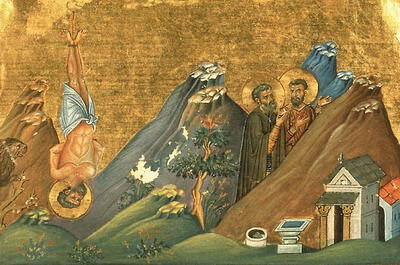 The Monk Zosima together with Athanasias was released and went off into the wilderness where, pursuing asceticism, they lived in a crevice in a mountain until their death. Saint Genevieve was born of wealthy parents in Gaul (modern France) in the village of Nanterre, near Paris, around 422. Her father’s name was Severus, and her mother was called Gerontia. According to the custom of the time, she often tended her father’s flocks on Mt. Valerien. When she was about seven years old, St Germanus of Auxerre (July 31) noticed her as he was passing through Nanterre. The bishop kissed her on the head and told her parents that she would become great in the sight of God, and would lead many to salvation. After Genevieve told him that she wished to dedicate herself to Christ, he gave her a brass medal with the image of the Cross upon it. She promised to wear it around her neck, and to avoid wearing any other ornaments around her neck or on her fingers. When it was reported that Attila the Hun was approaching Paris, Genevieve and the other nuns prayed and fasted, entreating God to spare the city. Suddenly, the barbarians turned away from Paris and went off in another direction. Years later, when she was fifteen, Genevieve was taken to Paris to enter the monastic life. Through fasting, vigil and prayer, she progressed in monasticism, and received from God the gifts of clairvoyance and of working miracles. Gradually, the people of Paris and the surrounding area regarded Genevieve as a holy vessel (2 Tim. 2:21). St Genevieve considered the Saturday night Vigil service to be very important, since it symbolizes how our whole life should be. “We must keep vigil in prayer and fasting so that the Lord will find us ready when He comes,” she said. She was on her way to church with her nuns one stormy Saturday night when the wind blew out her lantern. The nuns could not find their way without a light, since it was dark and stormy, and the road was rough and muddy. 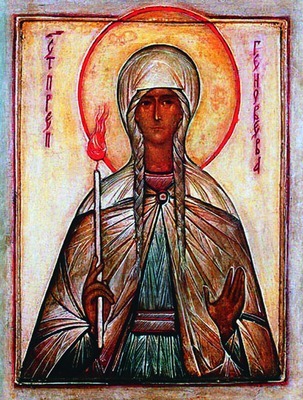 St Genevieve made the Sign of the Cross over the lantern, and the candle within was lit with a bright flame. In this manner they were able to make their way to the church for the service. There is a tradition that the church which St Genevieve suggested that King Clovis build in honor of Sts Peter and Paul became her own resting place when she fell asleep in the Lord around 512 at the age of eighty-nine. Her holy relics were later transferred to the church of St Etienne du Mont in Paris. Most of her relics, and those of other saints, were destroyed during the French Revolution. In the Middle Ages, St Genevieve was regarded as the patron saint of wine makers. The Monk Theoktistos founded a monastery in the city of Kucuma on the island of Sicily, where he became hegumen. At his monastery lived Greek monks, having fled persecution by the iconoclasts. The monk died in the year 800. 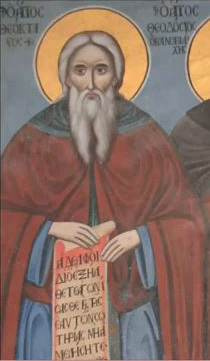 The MonkMartyr Euthymios, Hegumen of the Batopedeia Monastery, and with him 12 Monks suffered on Athos in the XIII Century for denouncing as heretical the Latinisers patriarch Michael Paleologos (1261-1281) and patriarch John Bekkas (1275‑1282). The hegumen was drowned in the sea, and the monks – were hung. Saint Euthymius the New of Thessalonica and Mt Athos, in the world was named Nicetas, and he was a native of the city of Ancyra in Galatia. His parents, Epiphanius and Anna, led virtuous Christian lives, and from childhood their son was meek, pious and obedient. At age seven he was left fatherless and he soon became the sole support of his mother in all matters. Having entered military service, Nicetas married, on the insistence of his mother. After the birth of a daughter, he secretly left home in order to enter a monastery. For fifteen years the venerable Euthymius lived the ascetic life on Mount Olympus, where he learned monastic deeds from the Elders. The monk went to resettle on Mount Athos. On the way he learned that his mother and wife were in good health. He informed them that he had become a monk, and he sent them a cross, calling on them to follow his example. On Mt Athos he was tonsured into the Great Schema and lived for three years in a cave in total silence, struggling with temptations. St Euthymius also lived for a long time as a stylite, not far from Thessalonica, instructing those coming to him for advice and healing the sick. The monk cleansed his mind and heart to such an extent that he was granted divine visions and revelations. 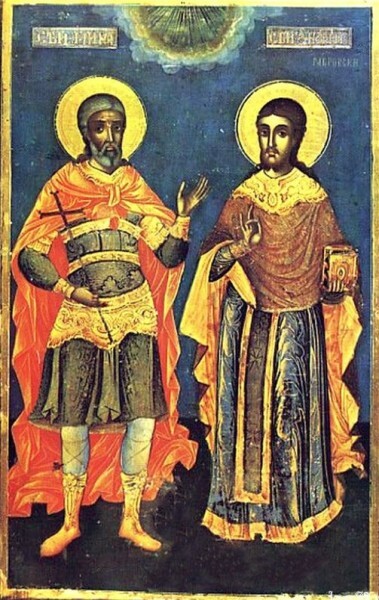 At the command of the Lord, St Euthymius founded two monasteries in 863 on Mount Peristeros, not far from Thessalonica, which he guided for 14 years, with the rank of deacon. In one of these his wife and mother received monastic tonsure. Before his death he settled on Hiera, an island of Mt Athos, where he reposed in 898. His relics were transferred to Thessalonica. St Euthymius is called “the New” to distinguish him from St Euthymius the Great (January 20). Troparion — Tone 8 The image of God was truly preserved in you, O Father, / for you took up the Cross and followed Christ. / By so doing doing you taught us to disregard the flesh for it passes away / but to care instead for the soul, since it is immortal. / Therefore your spirit, venerable Euthymius, rejoices with the angels. Kontakion — Tone 2 Crossing dryshod through the storms of life, / venerable and divinely wise Euthymius, / you mightily drowned the bodiless foe in the streams of your tears; / you received the gift of miracles to heal all sufferings. / Unceasingly pray for us all.